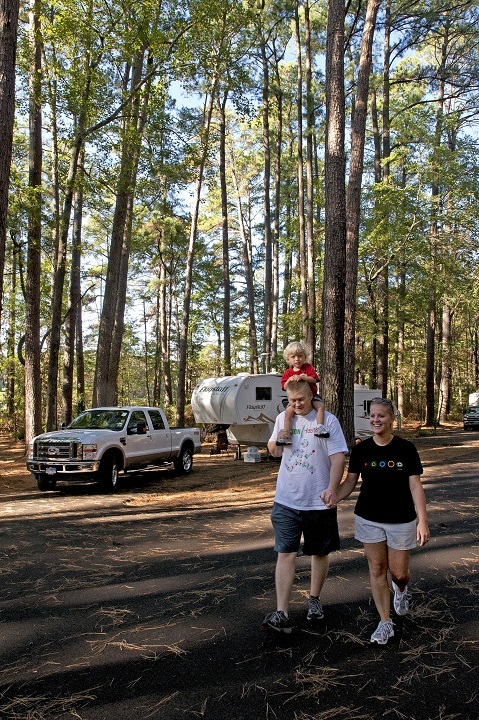 Family Hiking Near RV at Daingerfield State Park. Hard to believe, but another new year is just days away. Karen Zimmerman, who is a State Park Ambassador, offers a couple of suggestions to help you connect with the outdoors and yourself in 2016. If you’re not getting outside try to go outside – even if it’s just walking outside. It’s amazing the benefits that that can bring to our mind. If you need to think on a problem, you should just let it marinate in your head while you walk among some trees. But, if you’re already into the outdoors recreation somewhat, and you want to take it a step further, I think the best resolution you can make to yourself is to try something that scares you. Because, there were so many things that I thought I just wasn’t tough enough to do – like repelling. And you might cry a little bit while you do it, but then afterwards you are going to feel so good. And, there is nothing in the world that can boost your confidence for months than undertaking something that scares you like that – and succeeding – because it’s actually not that hard, and you don’t need to be in that great of shape to do most of these outdoor activities. Explore outdoor activities available in state parks and natural areas when you visit the texasstateparks.org. This entry was posted on Monday, December 28th, 2015 at 12:00 am	and is filed under Children in Nature, State Parks. You can follow any responses to this entry through the RSS 2.0 feed. You can leave a response, or trackback from your own site.